Wisdom teeth are probably the most mysterious type of teeth. Many people don’t know how many we’re supposed to have, or why we have them. 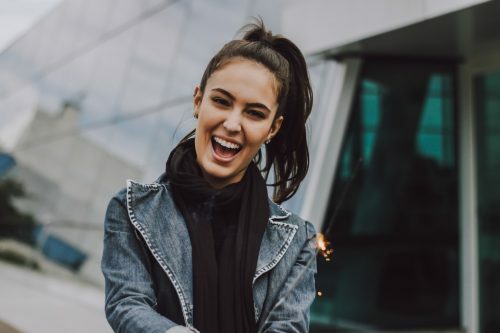 A lot of our clients also have some common misconceptions about our third molars, so we’ve come up with a guide to help explain the truths and debunk the myths about wisdom teeth. This is correct. Most humans have two wisdom teeth in the upper jaw (one on each side, at the back) and two in the bottom jaw (again, one on each side, at the back). Although we are supposed to have four, it is rare to find a person with four fully-erupted wisdom teeth. This is an extremely common misconception, and it’s easy to understand why. When wisdom teeth erupt, you automatically assume that they must make room for themselves by pushing your other teeth out of the way. In fact, research suggests that wisdom teeth do not exert enough pressure that would cause overlapping or dental crowding. This is true. Wisdom teeth usually erupt between the ages of 17 and 25, and they get their name because “with age, comes wisdom”. From the 17th century they were known as ‘teeth of wisdom’, until the 19th century when people started commonly referring to them as wisdom teeth. This is something that we hear quite a lot in the field of dentistry, but an impacted wisdom tooth doesn’t have to be removed if it isn’t causing any serious problems. Sometimes, food and bacteria can get trapped around the edge of impacted wisdom teeth, and they can be difficult to clean if they lay particularly low. This can lead to a few issues such as tooth decay, gum disease and abscesses, but it needs to be remembered that many of these problems can be treated with antibiotics and mouthwashes. According to the NHS, wisdom teeth removal should only occur when these other treatments haven’t worked. Before agriculture came into practice, our hunter gatherer ancestors would eat the likes of chewy meats, leaves and roots. They had larger jaws and extra molars (wisdom teeth) to help deal with their tougher diet. When agriculture did come along, humans in various settlements around the world began eating softer foods, which meant that there was no need for a large jaw and wisdom teeth anymore. Whilst the average jaw size has decreased over millennia, most people still have wisdom teeth because of evolutionary reasons. This is why a lot of people have issues when their wisdom teeth start to erupt. Hopefully this will leave you feeling a little bit more clued up on your third molars! If you’re experiencing any problems with your wisdom teeth, then please get in touch and we can arrange an appointment for you with one of our experienced dentists.